Dennise Buckley, originally from Ireland, is blessed with a talent – she understands what it takes to teach beginners how to make pottery. 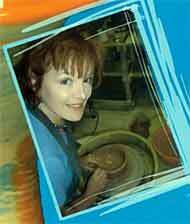 In this expertly produced DVD, she draws on more than 20 years of experience and passion with clay to explain the basics of handbuilding and throwing so anyone can enjoy success in working with clay. With step-by-step demonstrations on how to prepare the clay, handbuild and throw, Dennise’s instructions are clear and thorough. Her precise and light-hearted teaching methods make it fun to learn the joys of handbuilding and the art of throwing on the potter’s wheel. Dennise begins with wedging because it is the most critical step to assure success. She demonstrates both the ramshead and spiral methods while stressing the importance of how this focuses and concentrates your mind to prepare you for the work ahead. Explore the world of handbuilding as Dennise introduces pinch pots and slab building. Her demonstrations include making simple and complex pinch pots, soft slab construction, hard slab construction, and texturing. Projects include oval forms, planters, sushi platters and lidded boxes. 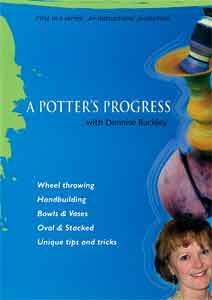 Form the basics of centering and coning, Dennise guides you through the basic cylinder and bowl and later on to the more adventurous tall and multi-part stacked forms. Through a series of many demonstrations that cover every aspect of wheelwork from pulling in thirds for making tall work to how to finish a rim, Dennise detailed instructions makes your chances of success even greater. Dennise Buckley’s DVD provides you with a lot of extras. In addition to the many helpful tips sprinkled throughout every demonstration, she also includes color images of historic examples from the Royal Ontario Museum and the Gardiner Museum of Ceramic Arts to support and illustrate the various techniques. Another bonus is the great videography that includes exceptional camera angles, cutaways, and insets that allow you many angles to view the demonstrations – something you wouldn’t get from a real life demonstration. Clay satisfies both my desire to work with my hands and my desire to create art. I make imaginative, experimental work. Using strong colors and a playfulness, my ideas and emotions are released through lively form. Vases and bowls are boldly painted in shades of chartreuse, turquoise and orange. More sculptural pieces depend on building up texture and layering color to create depth and mood. But whatever the direction, I believe it is my attention to detail and respect for the history of the craft that instills the work with spirit and energy and moves my creative journey onward. A Potter’s Progress was filmed in color by Genie-award winning cameraman Paul Freer, accompanied by an original musical score by Brandon Scott Besharah, and edited by Kim Killeen. This adds up to a winning combination of vivid images, clear cutaways and smooth tempo making it a joy to watch again and again. Whether you’re new to pottery, a weekend potter or an instructor, there’s something new for you!